Making a plan for the gym today!! Ok, so I am usually one to follow other people’s routines when it comes to workouts, but today I took some of the stuff I tend to like best and made it into a 50 min. treadmill workout and 15 min. ab sesh!! Soooo…I am going to post now and then let you know tomorrow how it went!!! 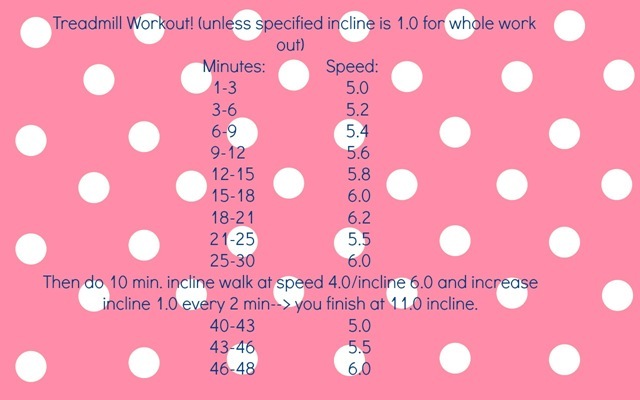 A treadmill workout for those who don’t run! So, let me start by saying that this workout is from last night at the gym, and it incorporates some jogging and intervals to create a workout ideal for those who are just starting to run or for someone wanting to push themselves hard, but not to their maximum energy expenditure. I had been working on my running for about 5 months and was at about 5 and 1/2 miles in 55 minutes when I unfortunately hurt my leg and was basically doing elliptical workouts and strength training for about 2 months while I let my leg heal. I was initially kind of bummed out about this because I knew it meant my running endurance would suffer, but it was actually a great reminder to start switching up my workouts instead of focusing solely on just running! For me this was a huge wake-up call because I was so focused on running for as fast as I could and as long as I could, that I was actually overworking myself and going back to some of my disordered thinking (aka the need to burn calories and workout as often as possible instead of working out to feel good and gain strength/energy). I now have incorporated more time for strength training and other cardio machines so that my weekly workouts are challenging and fun and mix things up, AND I can also see my body changing in a more positive way where I now have more toned muscles! So, all in all my injury was a positive because it helped me to slow down and remember that disordered thinking can sneak back up on me if I’m not careful! And, on that note I bring you my 48 minute (no, not 45 or 50) treadmill workout!!! On top of this I also incorporated some EXTREME ABS!!! that my sister and I did together from a workout I got off of Pinterest….